Ever growing competition has started producing more and more refined brains on a daily basis. With such stiff competition, it’s getting tougher to make way towards your dream job. Just to make things easier for hard working people who are super skilled, different sectors come up with different courses that declare how learned and efficient a professional is. And one such valued certification in the technical sector is, NICET (National Institute for Certification in engineering technologies). The history of NICET dates back to 1961 when some expert technicians, working at high designations, came up with an idea of designing a test that could help fellow technicians to prove their excellence. The entire concept behind introducing NICET was talent hunt, and to produce multiple opportunities for all deserving candidates. Now NICET is one of the largest non-profit organizations across US. It conducts tests in four cycles. 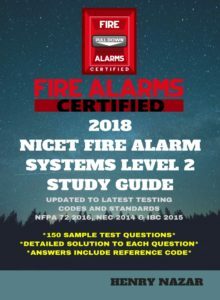 NICET fire alarm Certification is one of the most prestigious, and difficult, vocational tests conducted all across the United States of America for professionals in the fire alarm industry. It is equally beneficial for employers as it is for the employees. NICET fire alarm Certification helps employers in building a workforce, having handpicked experts, par excellence for their companies. In general, NICET certification creates a pool of multiple opportunities and high paying jobs at higher designations for technicians in different departments like fire services, construction, and many others. Categorized in 4 levels, NICET offers a fair chance to everyone. Professionals in level 1 are the ones who have served the industry for a minimum span of 3 months. All the level 1’s are junior level technicians. Professionals in level 2 are the ones who have an experience of at least two years. All the level 2’s are senior technicians. Professionals in level 3 are the ones who have served the industry for 5 years. They need a letter of recommendation sanctioned by their company to be eligible for the test. Professionals competing in level 4 are the ones who have served the industry for at least 10 years. They have to produce a letter of recommendation by their company and all the past documents that can prove that they have been working for the specified number of years. The passing candidates are automatically distinguished to be the best amongst their peers, and they get more chances at better companies and higher salaries. NICET fire alarm certification proves the skills of technicians in vivid departments like basic electricity, water based fire protection, power failure troubleshooting, and many other skills. The more levels a professional passes, the more skilled he/she becomes. And companies invest more on people who have different levels of expertise. If you have cleared level 2 and level 3 of the NICET fire alarm certification, there are more chances that you’ll be hired for higher posts. Also, when a company hires candidates with NICET fire alarm certification, it has better chances to impress the AHJ’s (authority having justification). Such a company has a strong reputation in building fire resistant and secure products. The most significant benefit that NICET fire alarm certification offers is- it successfully segregates level 3 professionals from all others. Level 3 involves the most important skill, ‘Special hazards Suppression Systems Layout’. ‘Special hazards Suppression Systems Layout’ is the blueprint of producing products that are fire resistant and safe. It’s also related to curtailing the use of any hazardous material while installations. Fire suspension agents are also the ones who hold level 3 NICET certification. And all these skills are extremely viable for customer and manufacturer safety. 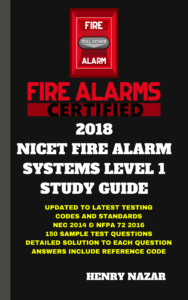 Check out our NICET Fire Alarm Systems Study Guides by clicking the images/links below.